It is about our dog, Sally, and how she "found" us, possibly with help from our cat, Isabelle. Since that time, Sally has been my constant companion when I am here at home. Last fall I noticed her stumble a couple of times, became worried about her and took her to the vet. Unfortunately, she had a ruptured disc in her back that required surgery. We had to take her to the Oklahoma State University Veterinary Teaching Hospital small animal clinic for this and she had to stay there for about a week. Needless to say, it was very expensive. If Sally had been an older dog or had other health problems, I supposed I might have considered having her put to sleep. They could not guarantee 100% success and there would be a long recovery period during which we would have to give her medication and follow strict instructions on taking care of her. But, I couldn't bear to have her put to sleep and decided to go ahead with the surgery. I had money I had been saving to remodel our upstairs bathroom and decided that project could wait. So, the money was used to help pay for Sally's back surgery. The surgery went well and she has recovered very well. 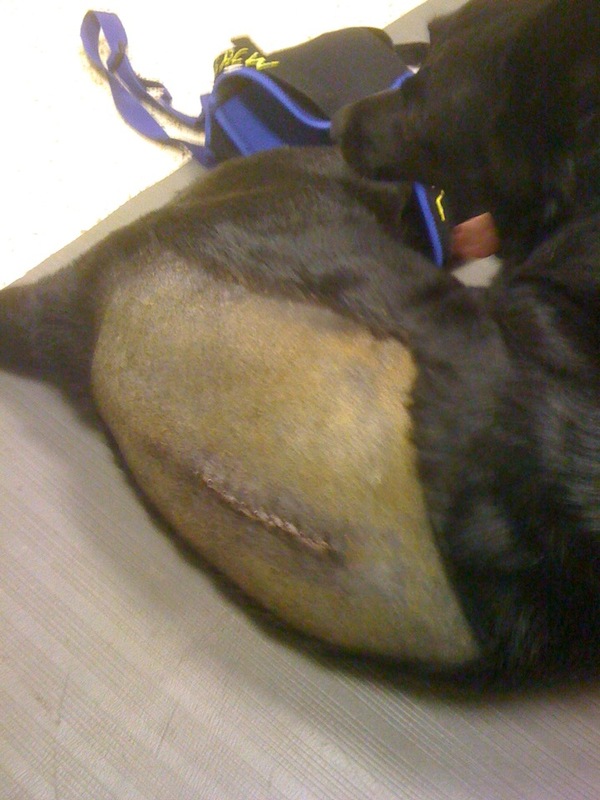 Here is a picture of her incision and stitches. While she was at the vet school hospital, they helped her regain strength in her legs by putting her on a "water treadmill", like below. She also had this funny little harness that fit over her back end and had a handle on it. We used it to help her get up after she had been laying down. She needed the extra help for a couple of weeks, but she gained strength quickly and was able to get up on her own after a week or so. After we got her home, we had to keep her inside and crated when she was not being fed or walked. A friend loaned me a huge metal dog cage in which she had plenty of room to turn around for this purpose. As the weeks went by, she made great progress and was given a clean bill of health after 8 weeks by the vet school to return to her normal activities. However, it took many weeks for her hair to start growing back over the area they shaved. Of course, it was winter during most of her recovery time so I know her back must have gotten cold when she had to go outside. When the hair did start growing back, it did so in odd patterns, like this. At this point, she seems to have made a full recovery and is back to her old self. One of her self-appointed duties is to keep watch while we are outside. Here she is on guard duty. She is a wonderful dog and I don't regret for one minute the money I spent on her surgery. It just means my bathroom remodeling project will have to wait a few more months. I mentioned we had ordered a "wildlife" package from the forestry service. This package contained several different types of trees and shrubs that provide food and cover for birds and other wildlife. Besides the sand plums, several Mulberry Trees were included. We had a mulberry tree beside the house when we lived in town. It was one that had grown up voluntarily, probably from seed deposited from a passing bird. Mulberry trees can be a nuisance if they are growing near a patio or sidewalk where the fruit can drop and cause a mess. The one we had in town was over near the corner of the house and was out of the way, so we didn't have that problem. It also provided nice shade in the summer time for a south window. So, I liked the tree. However, the fruit from our tree was quite tasteless. So, I never went to the trouble to gather it or cook with it. Anyway, we planted the Mulberry trees that came in the wildlife package around our 5 acres here on the farm. Here is a picture of one of them. It is still rather small. But, last week when I was walking by I noticed something red among its leaves. Upon further inspection, here is what I saw. I was amazed that it already was producing fruit and decided to taste one. Mulberries are ripe when they turn black, so I tried one of the black ones. OH MY! Was it good! Unlike the fruit from our tree in town, this little tree has very sweet fruit. So, I picked several just to eat for a snack. Unfortunately, there are not enough this year for anything other than snacking. However, I searched the Internet for recipes in anticipation of having enough next year for a pie. I was surprised to find several references to mulberries. Here is a recipe for a pie from Allrecipes.com that has 4.5 stars. Here is a link for making Mulberry Jam. Here is an interesting link about foraging wild food and mentions making wine from overly ripe mulberries. So, there is a wealth of information out there about mulberries and their uses. If you don't have a mulberry tree at your house, keep your eye out for one. You may be surprised to find one growing in your neighborhood that you can pick from. If you do, I hope it has good fruit like this little tree. We now have an outdoor pen for the chickens so they can go outside, get some fresh air and scratch around in the grass. Right now it is just a temporary structure. Tom plans to build them a more permanent one when he gets the time. But for now, here is their outside pen. It is covered over with bird netting to keep the chickens in and hawks (that might like to have one of them for dinner) out. As you can see there is an opening that allows them to go in and out of their "coop" which I talked about in the blog entry below. Inside the coop, there is a hinged door that can be lowered and fastened. We close this door at night after the chickens have come in to roost to keep raccoon, opossums and the like out. The chickens love this outdoor area (such as it is). Every morning when we let them out of the coop, they rush outside to see what tasty insect they might find in the grass. The other day one of them found a cricket. It caused quite a commotion and you would have thought a gold coin had been found instead of a lowly cricket. The one who found the cricket was chased by the others who were trying to get it. It was all quite hilarious! We still throw leftover lettuce and other greens in the pen for them. They like those too and will inspect them carefully before they eat them to check for caterpillars or other bugs that might be hiding in the greens. It amazes me how good their eyesight is and that they can spot a small green caterpillar that is exactly the same color as a piece of lettuce! I mentioned this to a friend last week and they pointed out that chickens are, in fact, birds and that all birds have good eyesight. Just think how an eagle or hawk can spot a small mouse in the grass from many feet in the air. That gave me a whole different way of looking at my chickens! I carry my "pocket" camera around with me most of the time and take pictures of things that I think are interesting or want to share on my blog. When I write an entry, I usually start with a picture or pictures and work the article around those. But, after a while, I usually end up with several pictures that I can't figure out what to do with. Such is the case with the pictures in this entry. The first picture is of Tom several weeks ago. He was setting out tomato plants in the garden. He uses large cans he has cut the top and bottom out of to put around the plants to protect them from the wind. And he uses cattle panel fencing to tie them to when they start getting big. He gave up on those flimsy tomato cages available at the garden centers. First of all, they don't do a very good job of holding the tomatoes up. And, second, they are a mess to try to store at the end of the season. The next picture is one I took after the last rain of some sort of animal tracks in the mud at the edge of our driveway. I was fascinated by them because they were so tiny. Perhaps it was a baby raccoon or opossum, but normally one this small would have been accompanied by an adult animal. And, I did not see any larger tracks with these. Finally, here is a picture of Tom and me at Christmas time. We were getting ready to go to a presentation of The Messiah that was presented by an OSU choral group along with members of the Stillwater community. Tom was one of those community members. He sings bass and has a wonderful voice. The performance was sold out and was absolutely wonderful. Fortunately, the people who sang in the performance were given free tickets for family members. So our daughter, her husband and I went. We are so proud of our dad and husband and the singing ability he is blessed with. On March 13, I wrote a blog entry about the bedding plants we were in the process of starting. It is hard to believe that the tomato and pepper seeds that were in those little boxes have grown into large plants and have either been sold at the market or planted by us here on the farm. Each of the boxes shown in the above link contains a different variety of tomato or pepper and it is very important to keep them straight as they grow and get transplanted into 4-inch pots and put in separate flats. It would be terrible to sell a jalapeno to a customer who thought they were buying a bell pepper! So, after the seedlings are transplanted from their starter boxes into a 4-inch pots, we make sure each pot is labeled with the correct variety. This is done using small white plastic stakes that have the appropriate variety name written on them. For several years, we hand-wrote the names on these little stakes. However, neither of us has very good hand writing and it sometimes got embarrassing if a customer could not read what was written on a stake! So, last year I began looking for a label maker. I was surprised at how much some of these cost. I searched online and didn't have a lot of success finding something that would work at a reasonable price. One day I was in Staples and noticed they had one on sale. It wasn't real fancy, but they had it discounted by about half and it looked like it would do for what we needed. So, I bought it. Here is a picture of it. The keyboard is smaller than a regular computer keyboard, but otherwise it has the same functionality.....backspace, line feed, upper and lower case letters, etc. The tape can be expensive if you buy it in a store. I found that I could order it cheaper online and that if I waited until P-touch had a sale on it, then I could get an even better price on it. However, even at that, it is still more expensive than if we hand-wrote the variety names on the plant stakes. It took me a while to figure out how to make the most efficient use of space on the tape. Eventually, I learned how to set the space that is left between each label to the minimum. In the picture below, you can see what I mean by making the white space between the words minimal. Finally, I cut the labels apart, peal the backing off and attach them to the aforementioned plant stakes.